I think SF Beauty Skin is a very special product, first of all. it does not have a physical store, but I found a very interesting and very useful service on the SF Beauty skin website - Online Dermatologist. This is definitely good news to working lady like me with busy schedule. Yes! It is very convenient, especially for a girl like me who has no time to visit beauty salon, with the helping hand through the online consultation, I finally learned about my skin and suitable products for myself. 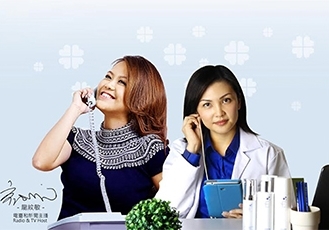 As a TV Host, Radio DJ and media people, my daily routine is very different from others normal 9am to 5pm office hour, I have no time to refill bottles and jars of skin care products, fortunately, SF Beauty Skin's Online Dermatologist will suits my lifestyle with my need for beauty after the consultation, provides me the products that close to my personality. One thing surprised me the most is SF Beauty Skin sent me a trial kit of free samples to let me try. This is beyond any services ortreatment, which allowing the customers to try for free before purchase without leaving home. It is simply fantastic, and the product is really easy to use, for example, their star product - 3 in 1 Remover Cleansing Gel, it is my cleanser, as well as make up remover, it is very convenient and I do not need to carry so many skincare products. Another highlight of SF Beauty Skin is Rose Magic Water, it is simply 'best friend" to girls, it can be sprayed directly to the face and completely absorbed by the skin, an excellent moisturizer, allowing me to stay confidence for the whole day without addifion makeup. As a savvy modern woman, we have to learn to spend wisely, not to mention, to buy the best products at the lowest price, and the most important of all is high product confidence level. SF Beauty Skin offer "try before you buy, free sample delivery to your home" service concept. It has fully met my needs, and I can make the most efficient and best quality purchase decision, it also eased the consumers' concern and worries, by their 100% money back guaranty policy within 10 days. Thank you SF Beauty Skin, now I can always look great and beautiful on the screen!